Electrefy is a start-up company based out of Ryerson Uniersity's Centre for Urban Energy. It provides reliable, clean, and noiseless energy storage for temporary on-demand power. Applications range from portable power for outdoor events to off-grid residences to emergency back-up power for traffic signals. We leverage leading edge technology from second-life electric vehicle batteries that are safe, robust, and cost-effective. Performance is optimized for market specific applications while using dynamic machine learning to maximize the lifetime of our systems. Our vision is to reduce portable diesel emissions, extend life-time of used EV batteries and make power systems affordable, and accessible to anyone, anywhere. 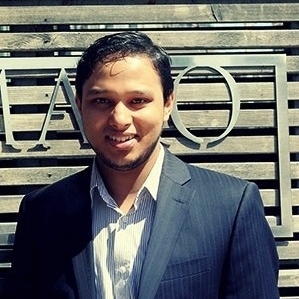 Ahsan is the CEO of Electrefy. He brings hands-on R&D experience from Rockwell Automation, Siemens and Honeywell Aerospace. Ahsan has 4 years working experience in industrial and aerospace power electronics and holds a Bachelor of Engineering degree in Electrical Engineering from Ryerson University.